Implementing a reliable, powerful monitoring solution used to be extremely challenging – specialist skills were required and the interpretation was complex, often resulting in false alerts and wasted effort. Not to mention the high costs. 1. 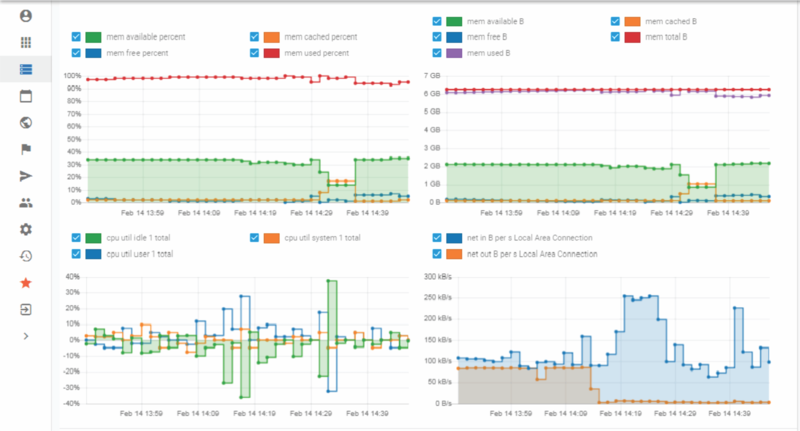 Performance, process and availability monitoring made really easy. 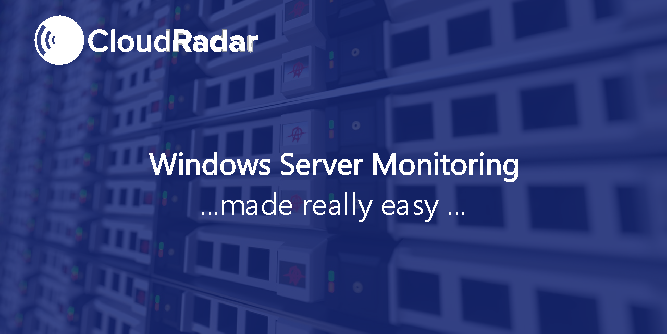 A modern, radically simplified server and network monitoring tool - set up in minutes, CloudRadar is designed to provide the easiest User Interface, while delivering comprehensive and powerful monitoring. Windows and Linux operating systems with agent-based and agent-less monitoring. Broad spectrum of metrics and alerting channels. Customizable alert thresholds and checks in a clean and distraction-free User Interface. Ever growing set of pre-configured monitoring checks for SNMP, Hyper-V, Vmware, Docker, LibVirt, MS SQL Server, MySQL, MariaDB and Postgres. 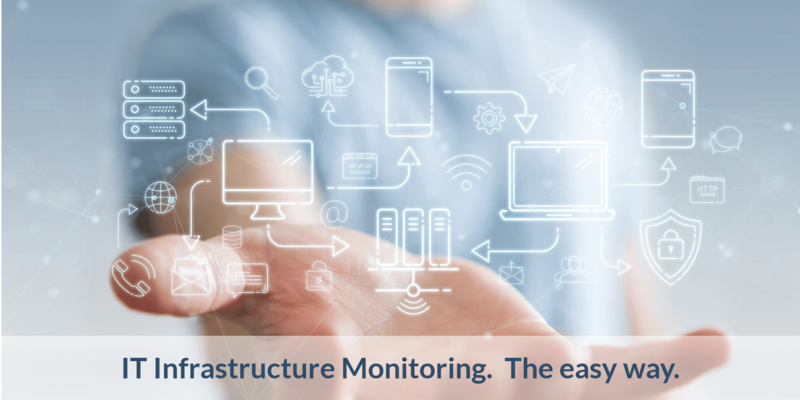 Monitoring server infrastructures can be complex, with different operating systems and software versions, and hybrid setups - partly located on-premise, with third parties and in the cloud. The most efficient approach to incorporate any setup is agent-based - a tiny, secure, one-way agent is installed on each server, transmitting metrics to a central monitoring console. Running on all Linux and Windows versions, over 50 metrics like CPU load, memory utilization, disk fill levels and process run-status are predefined. Rules and alert channels are pre-configured for a reliable start (yet allow for complete customization where needed). This means that the solution is active instantly with full functionality. Companies operating hybrid infrastructures - on-premise or cloud based, at hosting providers, or pure cloud providers like AWS/Azure - need a monitoring solution capable of including them all. On-premise network monitoring works via a tiny, secure application called “Frontman”. This acts as a connector between intranet(s) and the SaaS monitoring software. 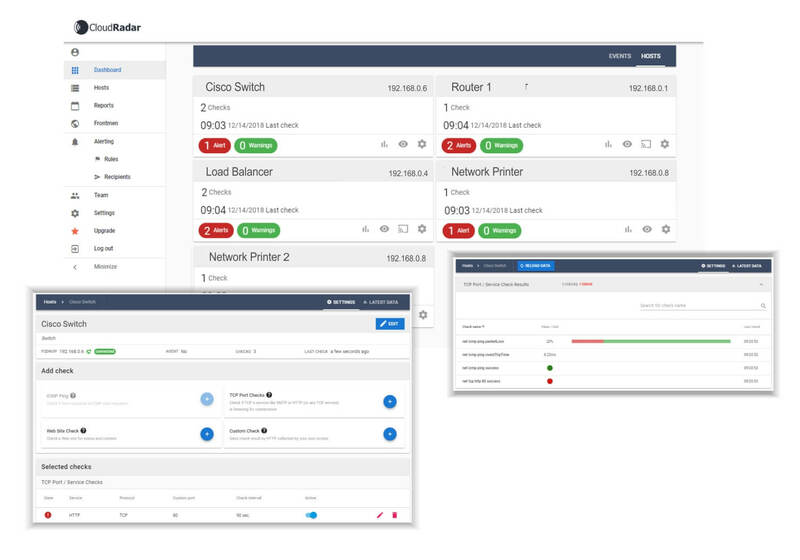 “Frontman” monitors the availability of your routers, switches, load balancers, security cameras – or any other network device with an IP address. The CloudRadar application receives availability data from all network devices across your intranets, and accumulates the availability data in one central interface. Alerting rules can be tricky: in the beginning you need reliable recommendations or presets, while being able to adjust some rules to your needs later. CloudRadar’s design principle was to operate reliably from the start. The alert engine comes configured with Smart Defaults. For instance: when you add a server to monitor, an automated alert when a disk fill level reaches 95% is activated immediately. Whenever you need, those values are customizable. Alerts and warnings are delivered via Email, Slack, Telegram, Pushover, WhatsApp or SMS - or configure your own via Webhooks. Traditional monitoring setups can take considerable time. Instant SAAS setup, without the need to install & maintain local software. Guided wizards for server/host creation and agent installation. Running from the get-go due to smart defaults on key checks/metrics and alerting. Try CloudRadar with a free trial! To decide on the best monitoring tool for your IT environment, you need to be comfortable with the solution at hand. Realising that, the free trial version of CloudRadar allows you to monitor free for 15 days - so you can verify that it works for you. No risks, and no credit card required. Get your Free account now and be up and running in minutes! Or read more about the CloudRadar solution.